Not Just A Cure For The Night Before! There’s something decidedly comforting and wintery about a smoky flavour, which meant that my visit to the newly revamped Seven Stars came at just the right time – a blustery, cold Sunday lunchtime. 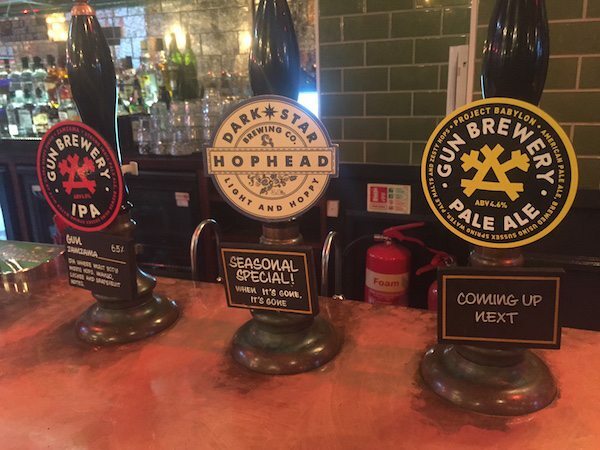 Located on the busy shopping area of Ship Street, the pub now features an impressive selection of craft beers sourced mainly from Beavertown and Camden Town Brewery, and three taps on rotation to showcase some more unusual brews. The kitchen has been taken over by the Little Blue Smokehouse, a company who have gone from strength to strength in the Brighton food scene, beginning their days selling delicious smoked meat offerings at the popular Street Diner pop ups, and later going on to win the South East heat of the British Street Food awards in 2014. Walking into the pub, I was pleasantly surprised at the decor, gone was the slightly dingy tables and chairs and lingering stale lager smell, replacing it a large drinking/casual dining area at the front, and a sweeping bar that showcases their range of craft beers and ten different speciality gins – including house-infused concoctions. The back booths were full so we chose to sit at the front, where we had a good view of the joint. After devouring the menu with our slightly bleary eyes, my boyfriend, Tom, (a meat-lover and human hoover) and I made our choices and headed to the bar to order. It was good to see that those with dietary requirements were catered for; the menu had clear markings for wheat free, veggie and vegan options. 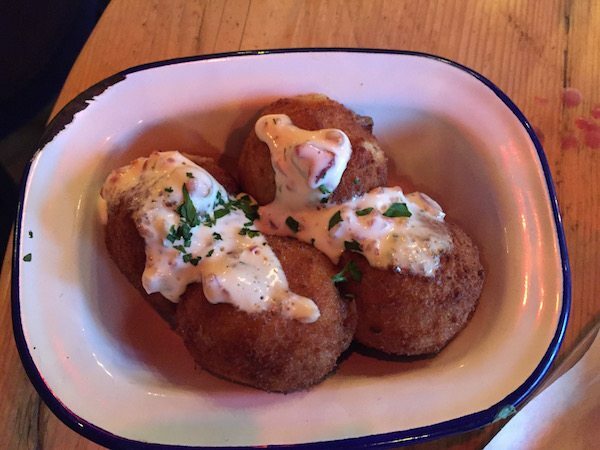 First up was the mac n cheese bites served with bacon jam and a bacon ranch dressing. 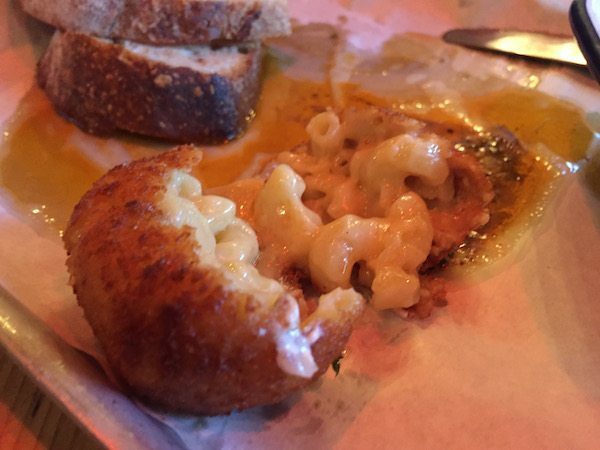 The mac and cheese was rich and creamy, rolled into little balls and deep fried to create the ultimate comfort food. The bacon jam was rich and salty, and the ranch dressing was creamy and smoky – both perfect accompaniments for this decadent dish. My hangover quickly depleting, I moved on to the next starter, fresh Sourdough bread served with melted BBQ butter and rich BBQ gravy dripping. The highlight of this simple starter was the gravy which was silky smooth and smoky – a Texan twist on a British favourite. The pub offers gluten free bread for a small extra cost, which is good news for those wishing to try out their extensive sandwich menu. 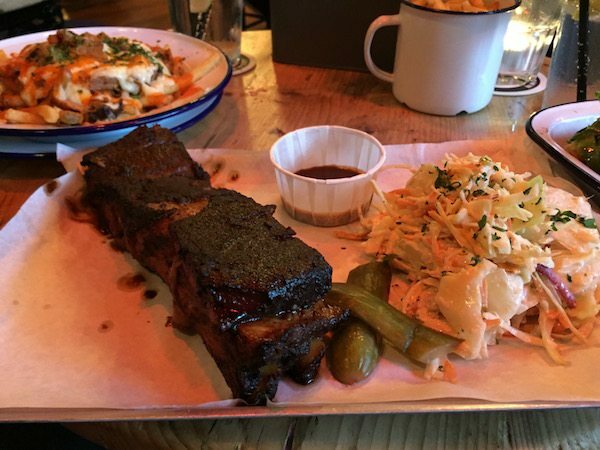 With our appetites revved, the friendly waitress brought over our mains, chargrilled smoked pork belly rib with slaw and pickles, and from the ‘Hangover’ section, the Trash Can fries served with pulled pork, fried pickles, cheese and hot sauce. 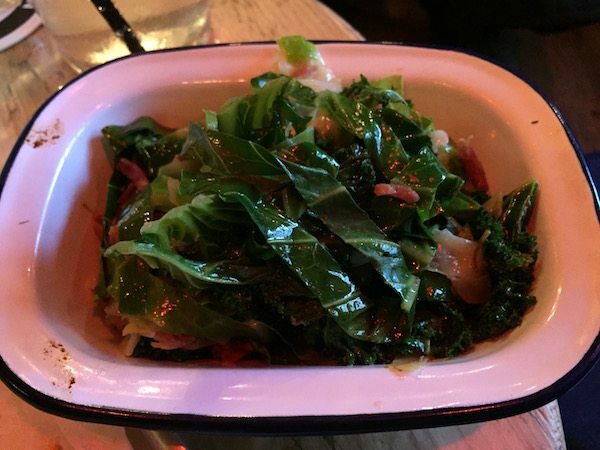 As if this wasn’t enough we also had ordered sides of seasoned fries and smoked ham hock greens which came served in dinky enamel dishes. The presentation of each dish was simple yet stylish, and let the food and the flavours do the talking. 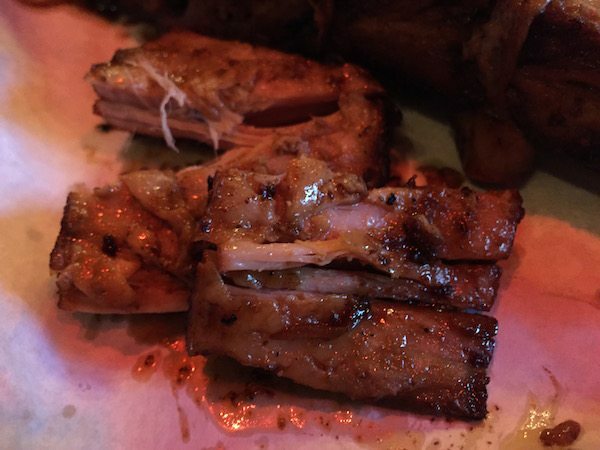 The pork rib was melt in the mouth, slightly over-charred on the outside but soft and smoky on the inside. The home-made coleslaw and pickles were the perfect accompaniments, as were the perfectly seasoned fries. 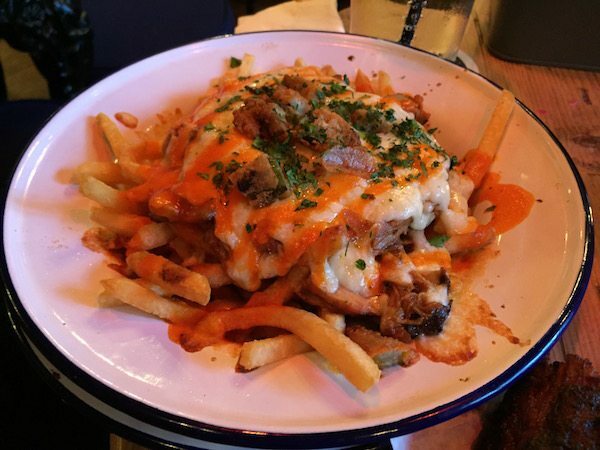 Tom loved the Trash Can fries, but it’s not a dish for the faint-hearted, with mountains of cheese-topped pulled pork and lashings of smoky hot sauce. By this time it was around 2pm and every table was full, a mix of studenty-types enjoying a hangover feast, and older couples. 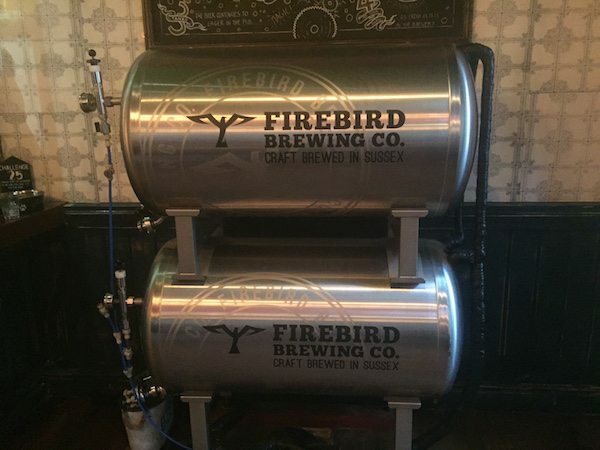 But everyone had something in common – they were all nursing a craft beer of some description, despite the giant vats of mulled wine decorating the bar. When our plates were cleared I had to admit defeat and request my leftovers be wrapped up to go, which our waitress happily agreed to do. There wasn’t an ounce of room left for dessert – which seems to be the norm seeing as there was only one pudding on the menu, a chocolate brownie with salted caramel sauce and vanilla ice-cream. 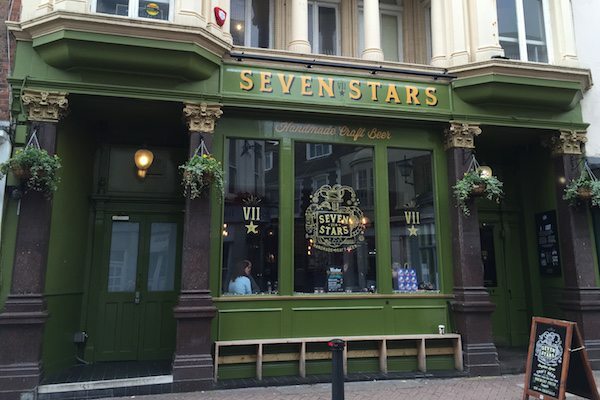 Who Would I Recommend Seven Stars To? 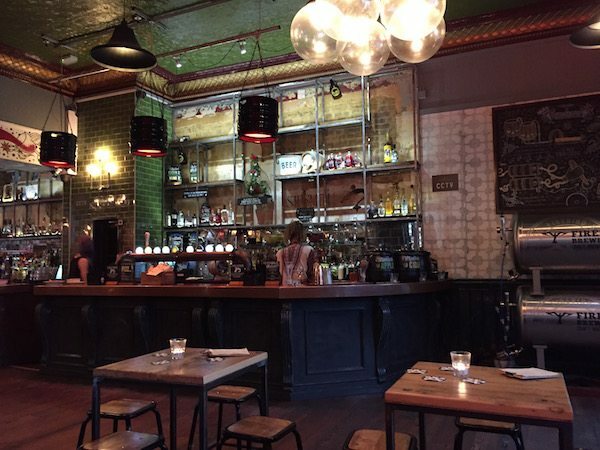 Those who love a craft beer or a gin and tonic in a relaxed and friendly atmosphere. 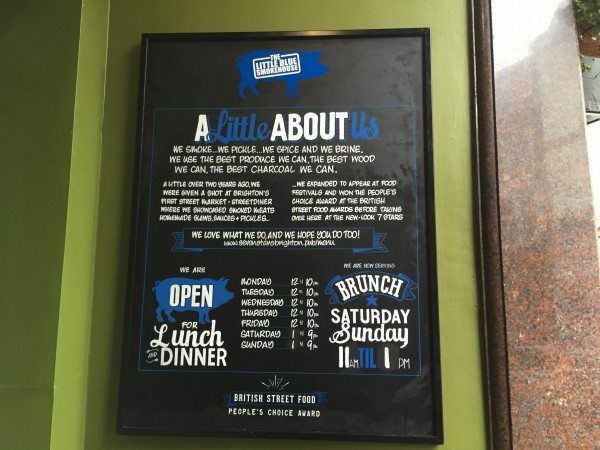 The menu mixes traditional soul food flavours with a nod to modern fusion, with dishes such as Korean fried chicken wings and Smoked Confit Duck hash, with kimchi and fried egg setting it apart from others who gone before. This is a destination that is way too tasty to be referred to as simply a hangover spot – although I will certainly be revisiting the next time I indulge a little too much on the sherry the night before.